Is it a board that is fun for the whole family? I enjoyed taking it out for a spin as well as my friend who’s it was her first time on a SUP! Read on to find out what we concluded. So I mentioned my friend and I took this board out, both taking it in turns. 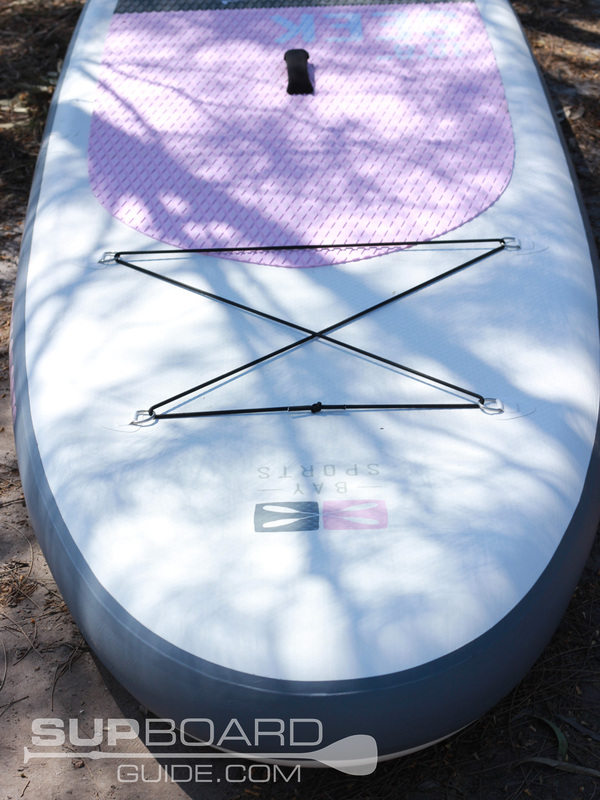 The other board we had with us was the Yoga Mandala SUP and Original Series 11’6” Tour. Both also Bay Sports. It was great to be able to jump between the few and get a feel. Having also recently ridden their 10’6” Explore which is quite similar to the Seek, it was insightful into the differences into the extra volume and fin on the Seek. The first thing I noticed was how stable the board is. It’s 6” thick and 34” wide so I wouldn’t expect it not to be! Though I believe because they have still used their Fusion Tec in the manufacturing process, the board feels even more stable than many others that are similar dimensions and shapes such as the Gili. Following the rock-solid platform, the next stand out feature was the glide and turning. At first, I was trying to understand why it felt different, surely it’s not just a new fin? But apparently such a simple, one improvement can make a huge difference. The new Connect II FCS fins that they have opted to use are a piece of work! I actually have one on my longboard too and found my performance improved dramatically with it. So I was one happy paddler to see them included on the Bay Sports! 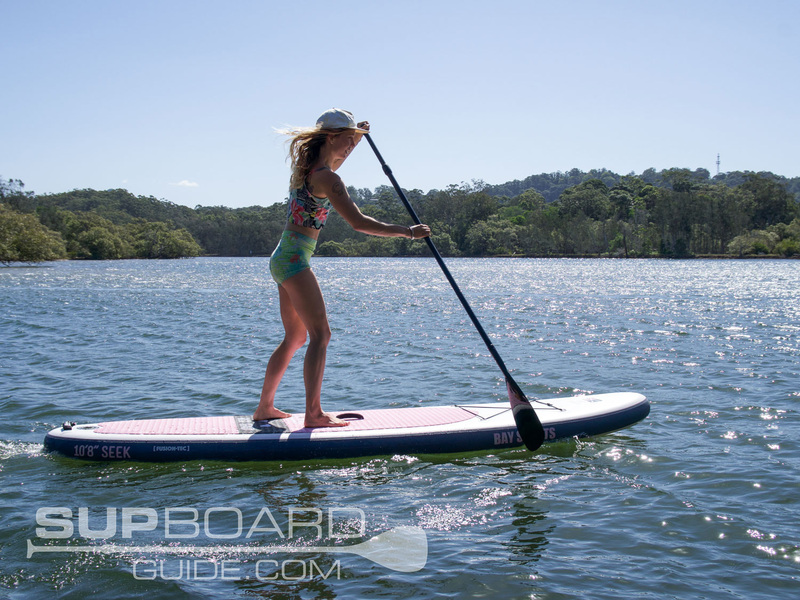 Moving around on the water was done with ease thanks to the glide and momentum it holds, having a slightly pulled back tail makes for easy turning while the large flat nose aids to your stability. This is truly a fantastic beginner/family board. It’s at a competitive price for everything you get too! Your durable but lightweight board is made up of a double layer PVC that reinforces a high tensile 1 mm drop stitch core. While not the strongest way of manufacturing an inflatable SUP, the result is more than enough for most riders. 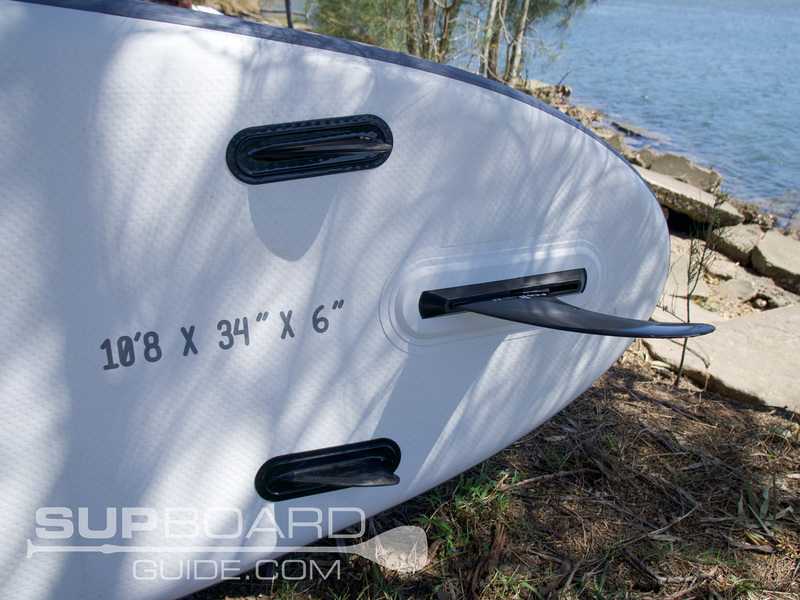 It also helps keeps costs down making this Bay Sports most affordable SUP, which I personally like they have included a board like this in their range. 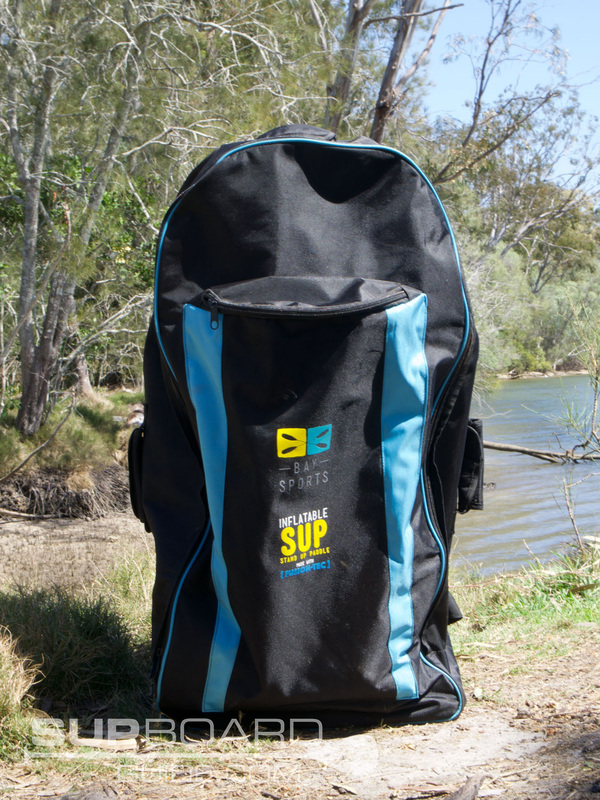 There are lots of people out there who just want to get in SUP-ing here and want to keep the initial costs low. Many of these people are also the average sized rider and happy to be going out on a leisurely basis, so this is a perfect match. I can’t say a bigger rider will feel as stable as I on board. The dual layering is efficient for weight shedding, but it isn’t going to be nearly as rigid when a larger rider gets on board. If that’s you, you’re better off looking at some of their other boards that are manufactured with Fusion Tec. Here is where the BASIX series delivers. You wouldn’t think something so small like one single fin could make such a difference to a boards performance, but it sure does! The new Connect II FCS fins not only so easy to use but also dish out some killer performance. They simply click into place, yes it’s a little worrying the first you put them in. I double and triple checked my fin the first time I used it, just didn’t seem right you can click it in, and that’s it! The dorsal shaped fin acts a fantastic rudder for turning but also given the high quality of materials it’s a super stable fix, meaning it excels with tracking also. I mentioned, in the beginning, I bought one for my longboard. These fins aren’t cheap, and they are some of the best out there! It’s a huge bonus to have them included in your package. Your inflate is your pre-workout! Getting your BASIX up to the recommended 15 PSI does require a little oomph but if you take a few breaks in between and remember to switch the actions over you’ll be sweet! Though I have to say with this new pump, I didn’t even need to take a break! Though I probably pump more boards up than the average person ha! 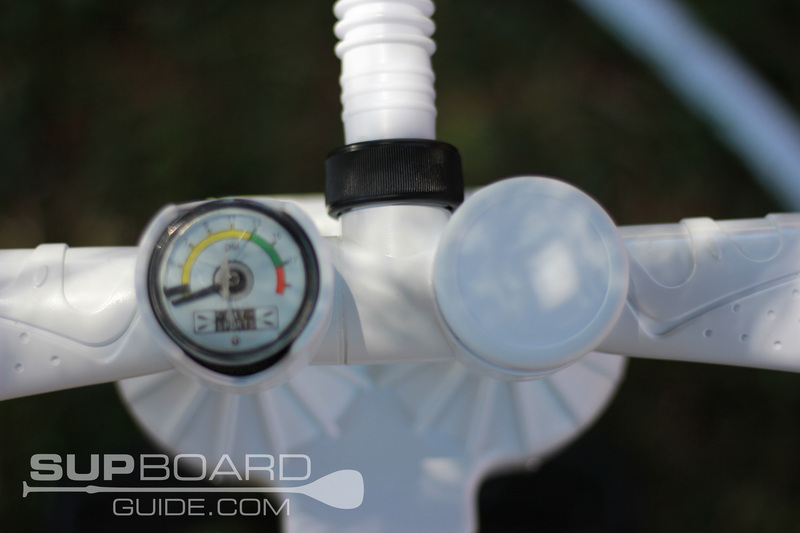 Either way, you’ll be absolutely cheering at how much easier it is to inflate your board! I’ve talked about the stability of the board a lot. So I’ll go into a little more detail into what makes this board stable in the way of design. A 6” thick base means you are higher from the water so less wobble. Not only that but apart from a rather slight pulled in tail the 10’8” Seek has a consistent shape throughout. This means no pronounced rocker or pointed nose. A consistent shape accentuates your stability as your movements are well balanced out throughout the board. Moving onto the aesthetics, you can get the BASIX series in 5 different color schemes. As you can see I got the pretty baby pink and grey. 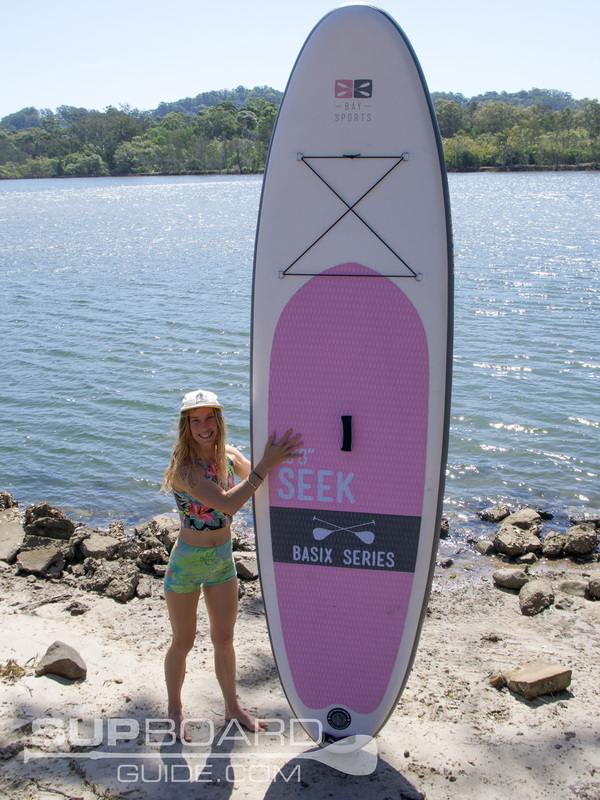 When I realized I got the pink board, I have to admit I was like oh nooo, I’m not really a “pink” girl, however, once it was all blown up and I was out on the water, I kind of changed my mind! They have done a great job at matching colors and choosing the right kind of tones. The platform in which you’ll be standing upon is not only comfortable but also efficient at keeping you from slipping off! The diamond grooved EVA deck pad not only keeps your feet sturdy, but it’s also so comfortable that I’ve been known to take plenty of naps on the Bay Sports boards. Moving up the board you’ll find the 4 D-rings with a bungee cord between them. There are so many things you can take out on the water with you to make the day a little more interesting, and it’s nice to know they can be secured. While it’s not the largest amount of storage space, it’s space out well so you can store some bigger items. My personal checklist is a dry bag, waterproof speaker, phone in water case, waterproof camera, sunscreen, jacket, and water bottle! Upgraded from the signature series is your paddle. 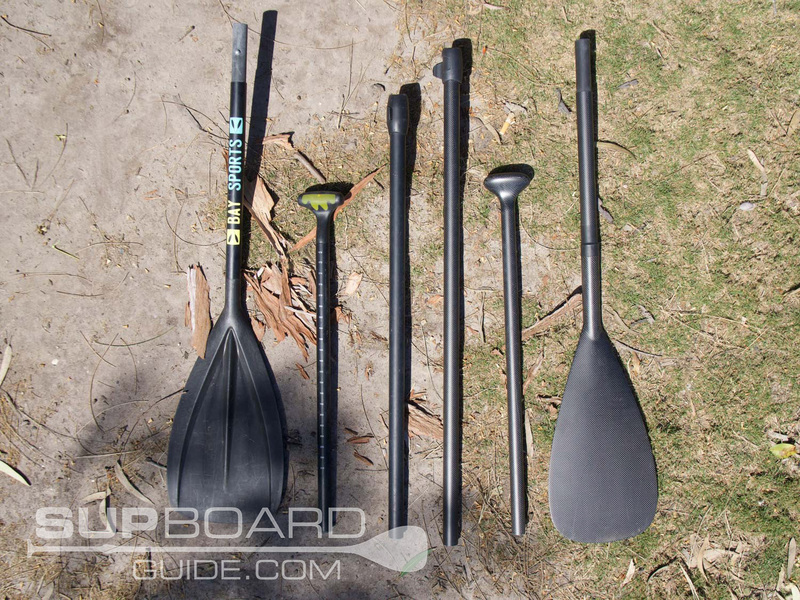 In the older models, the paddle you received was part plastic and part fiberglass. 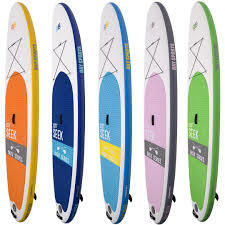 Now with all boards, you receive a full fiberglass paddle that weighs only 740 grams. arts. Though I find the hand grip on the old paddle much more comfortable. Move over and let this bad boy through! What a fantastic pump! The triple action dual chambered pump is a lifesaver. Whereas the last pump included was a dual action, now you get one more action to choose from. This helps with changing how easy/hard you want to pump depending on what pressure you’re at. 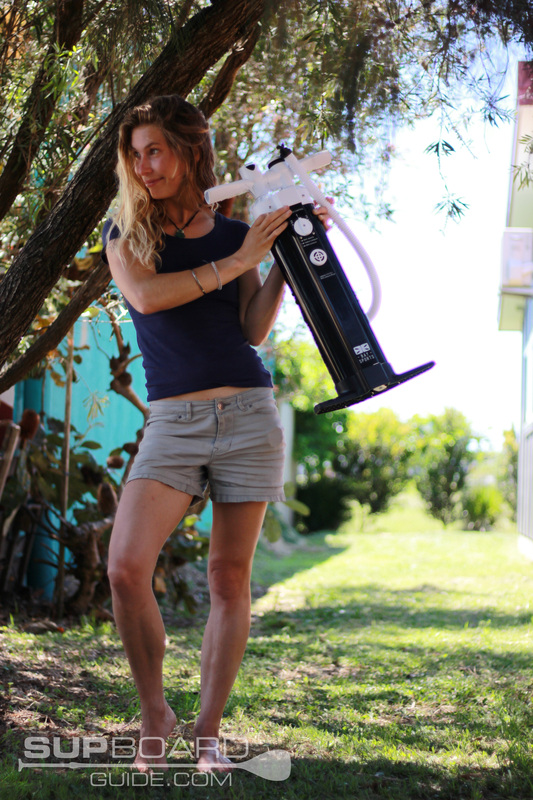 I have to say I found the new pump on par with Red Paddle Co’s Titan, which is saying something considering how much I loved that pump!! To keep you attached and safe is the leash, which has a little secret stash spot on the ankle for your keys. Baysports opts to use a coiled leash which helps with reducing harsh snapbacks. Keeping all your gear in one place and protected is the backpack. Given how lightweight the Basix is, it’s not too heavy to carry the board around on your back. The straps are also quite padded so found the weight to be easily supported. Another thing I always look for in a bag is how spacious it is as well as handles. It’s surprising how helpful a couple of extra handles on a bag can be! The thing with bag space too is that more is not always better. The ERS bag I have found to be too big, it’s easy to get everything in, but it doesn’t pack down neatly with all the extra space. 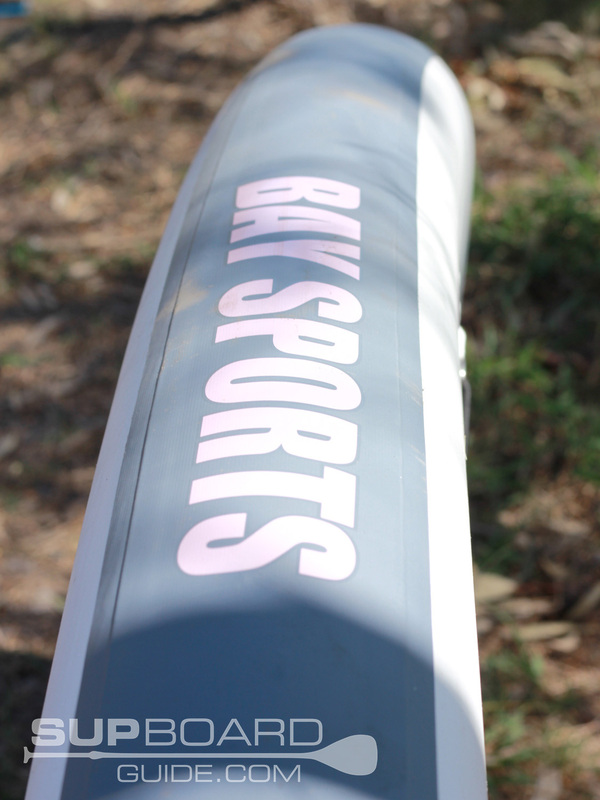 Bay Sports backpack is one of the better backpacks, just like to see some wheels on there someday! Inside your repair kit, you can expect to find much the same items as any other kit. A valve tool, some patches, and glue! If it’s a family board or beginners board you after, you can make a confident purchase with the 10’8 Basix. Saying that this is also a great affordable option for those who just want a second board but don’t want to completely skimp on quality. 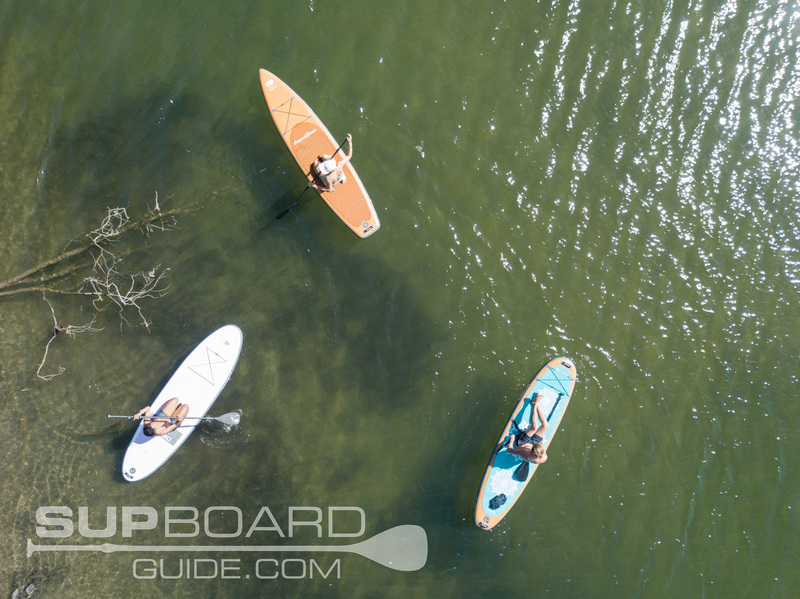 If you were to scroll through our mid-range list, you’ll find most boards are either double or triple layered, so while you can get sturdier and stronger boards, you won’t find them in this price range. I have to admit I was surprised it was only a double layer. My other experiences riding a double such as the Gili and then the triple layer like the old iRocker models was that there was a noticeable difference. I honestly thought it was made with Fusion Tec like the rest of their boards or maybe a triple layer, it felt so stable and strong! With such a large selection of colors too, this is a board that suits everyone’s aesthetic choices as much as skill. Baysports customer service is something that is noted quite regularly in other reviews, and my own personal experience has been nothing short of superb also. Keep in mind all products have a 2-year warranty and 30-day return policy, so you know this is a company standing behind their products! I’m looking for mid range board that I can take a 7yr old child along on (100kg combined wt). 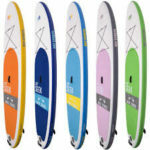 I have been looking at the baysport basix seek and the iRocker 10ft all rounder. I’m in Australia so the iRocker range does not include the latest models. Which of these two would you recommend or is there anything else in a similar range that I should consider? I believe the Baysports BASIX is better valued than the old iRockers. It’s a shame we don’t have the new iRockers yet but it’s something I’ve been bugging them about for a little while, who knows, maybe that’ll change! Otherwise, for a kid as well, I would recommend the iRocker as the new ones have handles on the nose which adds safety for little ones. Might even be worth your while sending them an email too! But, the BASIX is an awesomely priced boards for all its features and accessories! I’ve tried nearly all of their boards now and can say there’s a high level of quality across all of them.